The Academy’s Urbanism Awards assessment visits are integral to the overall aim of Learning from Place and the annual Awards Ceremony is one of the highlights. In assessing cities, towns, neighbourhoods, streets and places, teams need to adopt a mindset that relates to the differing scales of these urban forms. Unlike the other awards, the cities category gives us a chance to look outside the UK & Ireland; and in recent years most finalists have been in mainland Europe. Starting last year, the Urbanism Awards selection process has benefitted from a new structure whereby themes, such as ‘post-war’ in 2017 and ‘post-industrial’ in 2018, have been chosen. This narrows down the possible choices, makes it easier for comparisons to be made between otherwise diverse places that are addressing similar challenges, and broadens the range of candidates to include second- or third-tier cities that might otherwise be overlooked. Foreign languages, currencies, time-zones, transport systems and shop opening times all need to be taken on board, and the visits are interesting hybrids of work and holiday that include the pleasure both of spending several days together with colleagues one knows well and getting to know others for the first time. Conversations consist of a mixture of urban-design-speak, when, where and what to eat and how to get to the next meeting, all punctuated by constant forays to take countless photos of whatever catches the eye. Fortunately, local guides are patient cat-herders. Academicians attending their first overseas assessment visit are usually instant converts to the experience of exploring a new place with like-minded companions and sharing the challenge of working out what makes the places special and how the lessons-learned could be applicable elsewhere. This year’s visits were to Nantes, Zurich and Leipzig. On a combined trip in the last week of August, nine of us attended the Zurich assessment and eight were in Leipzig. Five of us attended both cities, and three had also been in Nantes. 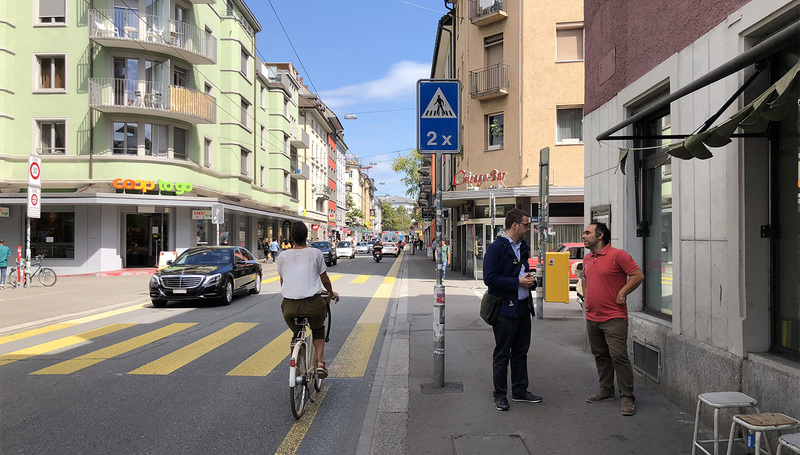 Our visit fulfilled all expectations of Zurich as one of the world’s most liveable cities, with well-managed housing strategies, excellent connectivity based on admirable, ‘classless’ public transport and an extensive bicycle and pedestrian network. We learned that high living costs are offset by high wages – even low-skilled workers earn around €30 per hour – so it’s mainly visitors like us who experience mostly mouth-watering food at often eye-watering prices! The city is compact, cultured, scores highly on sustainability and waste management and its local green spaces are complemented by picturesque foot/cycle paths alongside rivers where swimming is a popular pastime. There are also good connections into the surrounding hills, set off by the enticing backdrop of the snow-clad Alps. We were so impressed by Zurich’s achievements that when we considered Leipzig with its reputation for polluting industries and a turbulent history from WWII to German reunification, we were doubtful that it could match up. During that period, Leipzig’s population had decreased from 750,000 to 590,000 due to loss of employment, and had changed from being a thriving to a shrinking city. But, having been greeted by the magnificence of the railway station and wandering through the car-free city centre’s beautifully refurbished streets, squares and delightful passageways, we began to realise that, in its very different way, Leipzig’s achievement was every bit as praiseworthy as Zurich’s. In the city hall we were given excellent presentations about how Leipzig had turned its fortunes around in recent years, through an integrated strategy of economic, social and environmental initiatives. Having been shown around the compact, walkable city centre we took trams and buses to former suburbs such as Plagwitz and Grünau, which are being transformed into sustainable, liveable neighbourhoods. 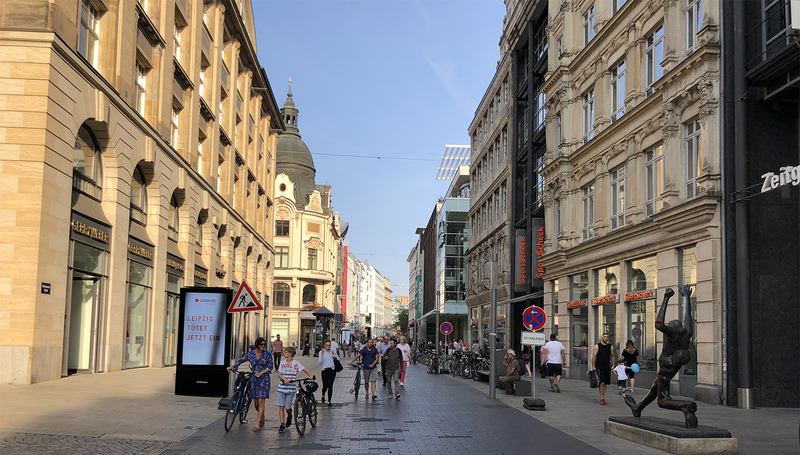 These measures are proving attractive both to former Leipzig residents and people from further afield, and the city is nurturing the regeneration process with great care. As we relaxed in a 17th century coffee shop, mulling over the relative strengths of the two cities we’d been visiting, a few of our team chipped in with glowing reports of their experience a month earlier, assessing Nantes. This was a further game-changer, making us realise that, for quite different reasons, there was a case for all three places to win European City of the Year!